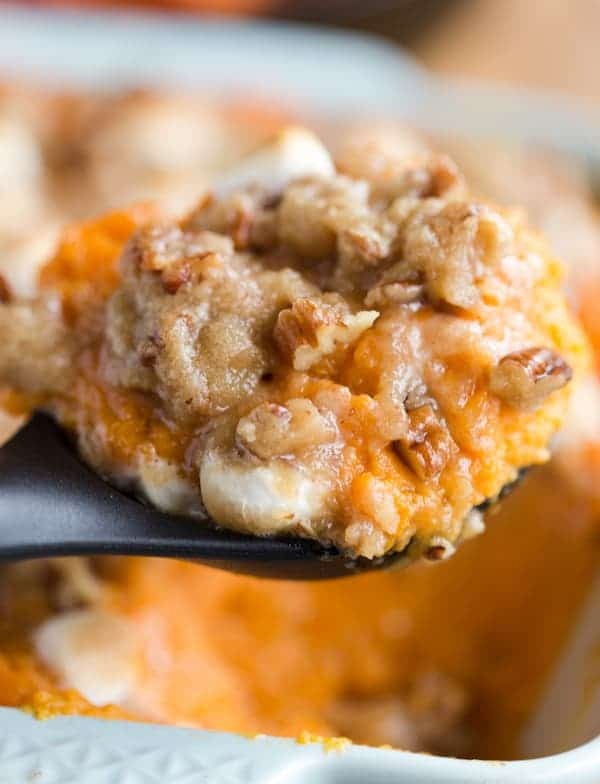 Instant Pot Sweet Potato Casserole has the perfect combination of spices and is a super easy and fast way to make sweet potato casserole! Even better, you can prep it ahead of time and just put it in the oven to warm up right before the big meal. Is anyone else in disbelief that Thanksgiving is less than two weeks away?! 10 days if we’re counting. Being a food blogger, I feel like every year I start testing Thanksgiving recipes well before October. This means by the time Thanksgiving arrives, I’ve had my share of turkey and mashed potatoes. While I did test a decent amount of recipes this year, we didn’t host a Friendsgiving on top of my run-through of new recipes. So there was really only one time to have Thanksgiving dishes, and we barely had any leftovers after the meal. I’m going into next Thursday (and Friday!) with a rumbling belly and I’m ready to eat alllllll the dishes! So far, I’ve shared with you guys my Instant Pot Green Bean Casserole and Instant Pot Turkey Breast (oh and don’t forget the Turtle Pumpkin Cheesecake), and I have to say – I LOVE how easy the Instant Pot is making Thanksgiving this year! While you can’t make every dish in the Instant Pot (unless you have five Instant Pots!) it’s really an amazing tool for making dishes faster and freeing up space in the kitchen. 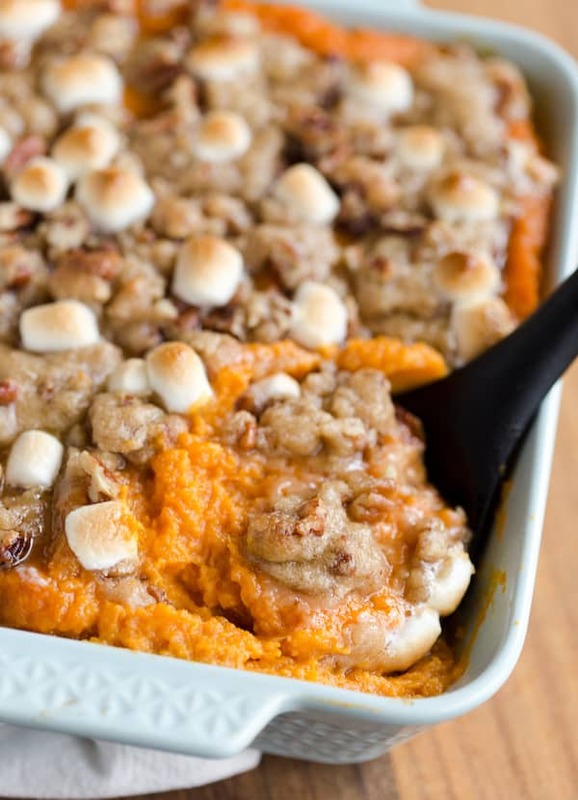 This recipe for Instant Pot Sweet Potato Casserole can even be made ahead of time. 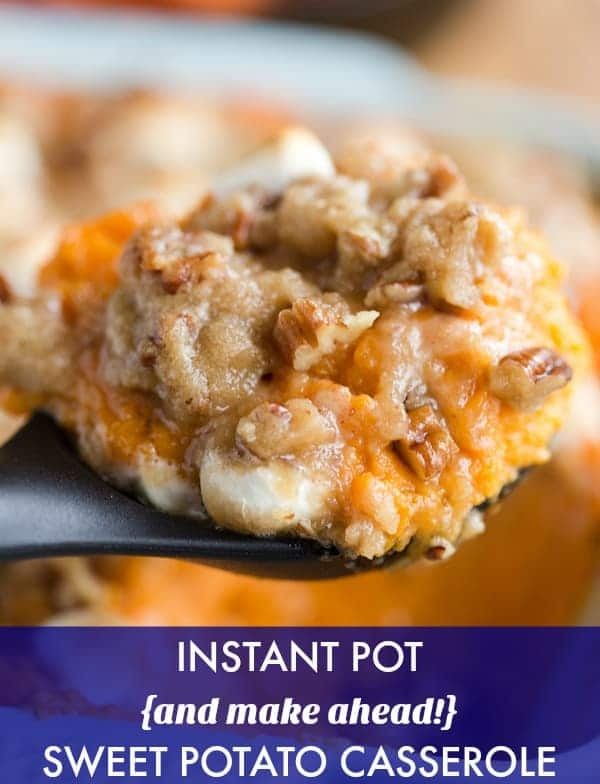 So now you can make Instant Pot Sweet Potato Casserole the day before Thanksgiving and THEN Instant Pot Green Bean Casserole the day of Thanksgiving! This Instant Pot Sweet Potato Casserole was definitely one of the highlights of my Thanksgiving recipe run-through. It was the perfect combination of lightly sweetened potatoes with a marshmallow/pecan crumble combination topping. Speaking of the topping – are you team marshmallows or no marshmallows? I personally love a combination of marshmallows and brown sugar, so I did the logical thing and combined them! I did a sprinkle of marshmallows and a super tasty brown sugar and pecan mixture and it was the perfect combo of crunchy and sweet. 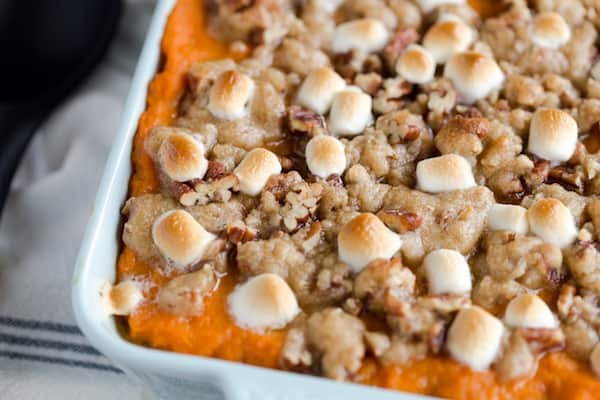 Okay, let’s wrap up by talking about how this Instant Pot Sweet Potato Casserole can be made ahead of time. Basically, you’ll do all of the Instant Pot prep in advance. 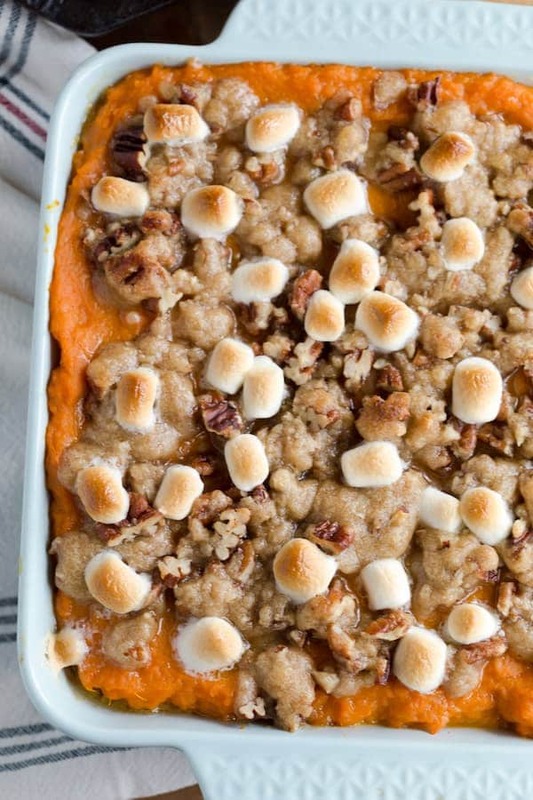 This includes cooking the sweet potatoes and mixing it with the butter and spices. Then you spread it in a casserole dish, make the brown butter and pecan topping, and finish it off! 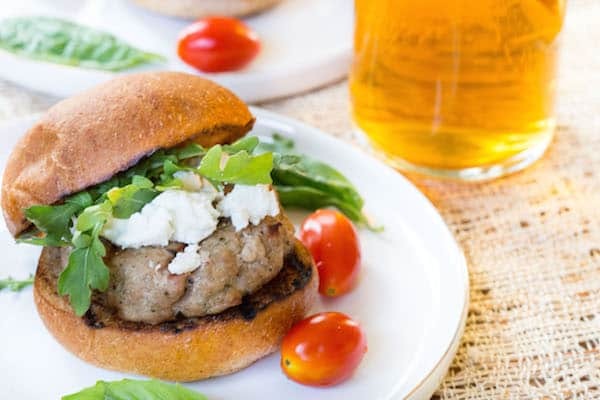 Wrap it with some plastic wrap and stick it in the fridge until you’re ready to bake it. So easy. So simple. And so delicious! Place water and sweet potatoes in pressure cooker. Cook on high for 8 minutes. Let the pressure naturally release. Remove lid and strain the sweet potatoes. 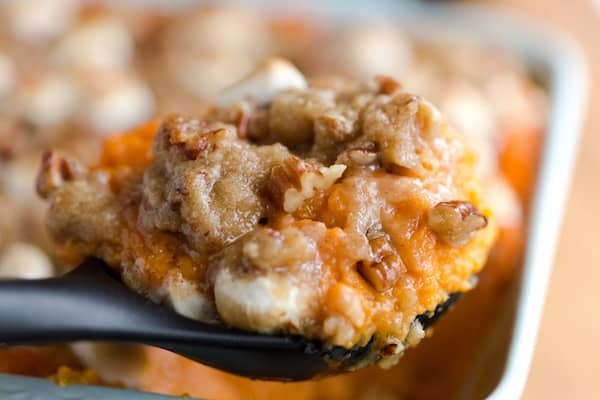 Mash the sweet potatoes with a fork - this should be extremely easy because the sweet potatoes will be very tender. Add butter, brown sugar, maple syrup, vanilla, cinnamon, cream, and egg to sweet potatoes and stir well to combine. Spray 8" baking dish with cooking spray. Spread sweet potato mixture into baking dish. Make the topping by combining melted butter, flour, brown sugar, and pecans in a small bowl. Evenly spread/drop pieces of the topping over the sweet potato mixture. 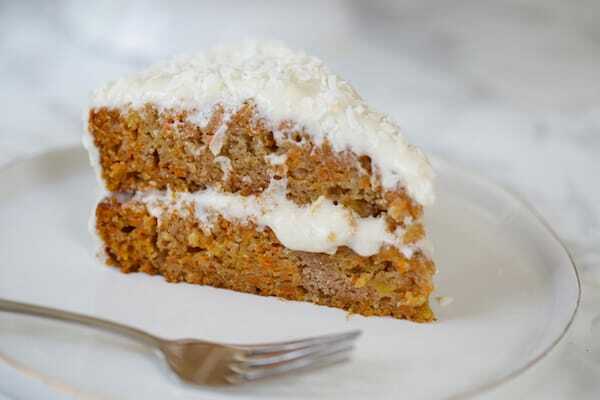 *At this point, you can cover and refrigerate overnight. Bake in preheated oven for 25-30 minutes, until marshmallows are golden. Total time does not include the time it takes for the pressure cooker to build pressure.